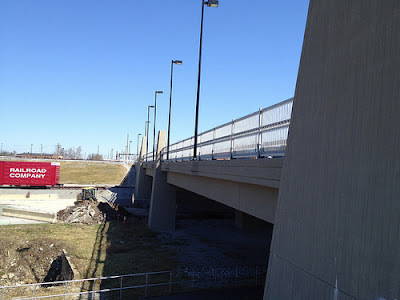 Oliver Lewis Way Bridge - Lexington, Ky.
At the western edge of the Rupp Arena is the Manchester Street parking lot. This parking lot travels under the Jefferson Street viaduct before coming to an end near the new bridge at Oliver Lewis Way. Although the bridge is rather nondescript, the view from it can be described as anything but. In Lexington's never-ending labyrinth of street names, the parking lot was once known by Cox Street because that was the road that extended Newtown Pike from Main Street to High. A rebuilt Newtown Pike Extension was renamed Oliver Lewis Way (slightly west of Cox Street) in time for the 2010 World Equestrian Games. The extension is a fantastic bypass of downtown which I've utilized many times, though recently on foot for the first time. 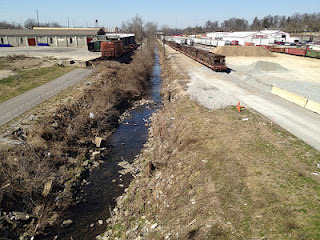 Panoramic View, facing west, from Oliver Lewis Way Bridge - Lexington, Ky.
All visible are the Distillery District, the Town Branch Creek and the RJ Corman Railyard. About 100 years ago, much of this was open land to receive seasonal flooding of the town branch. 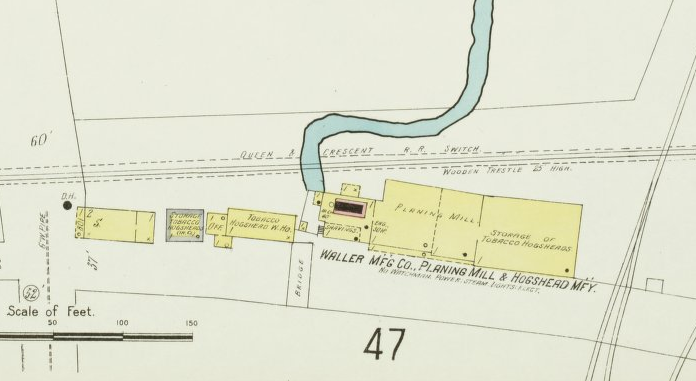 The bridge today sits largely over the building and the "s-curve_" in the Town Branch as seen in the 1907-1920 Sanborn Insurance Map below. The building was industrial in nature - the home of the Waller Manufacturing Company, Planing Mill and Hogshead Mfy. A hogshead was a large (225 litre) wooden barrel used typically to hold tobacco or, more importantly given the proximity to several Lexington-based distilleries, to age bourbon. Sanborn Insurance Map (1907-1920); Source: KDL-KYVL. 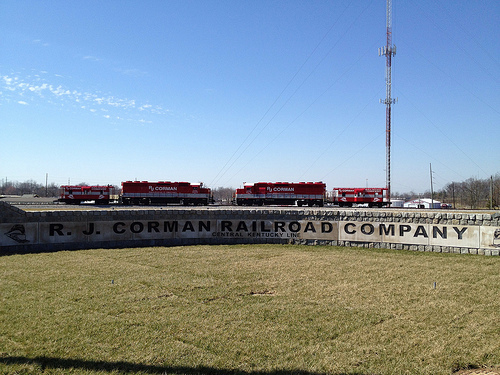 Town Branch Creek - Lexington, Ky.
RJ Corman Railyard - Lexington, Ky. 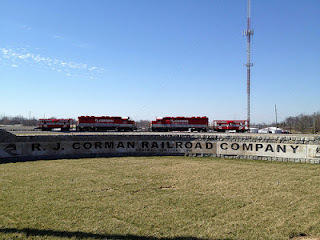 There is a lot to see from the Oliver Lewis Way Bridge, but you must take the time to observe it. And I'm sure in my few minutes that I missed a lot. What else do you see?